Refurbish the Animal Care Facility, with longer opening hours and more humane conditions. Ben was elected to Campbelltown City Council in 2016. He has a keen interest in local government as a force for economic equality and social justice, and particularly in the right of communities to shape the form and function of their cities and have them remain public and accessible to all. He is committed to a Council that is sustainable, that works with community need, not private profit, and that protects local built and natural heritage. Ben has fought locally against the destruction of TAFE, against coal seam gas, for protection for local wildlife and for funding for public services and programs. 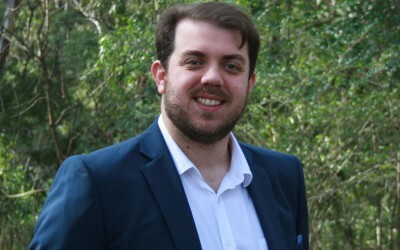 Ben has a Master of Science in nanotechnology and magnetic resonance imaging and a Master of Teaching, and is a proud member of the NSW Teachers Federation. He has worked in hospitality, scientific research, policy and now as a secondary teacher. Campbelltown is experiencing massive growth, with large amounts of southern Campbelltown planned for development as well as redevelopment of existing suburbs. The Greens will work for a 20% public and social housing target in the plans for any new major development in Campbelltown. The Macarthur Legal Centre operates the Macarthur Women’s Domestic Violence Court Advocacy Service, a vital program for aiding and advocating for victims of domestic violence in Campbelltown. The service is under threat from massive Federal budget cuts. The Greens will secure a rent-free Council building for the Legal Centre. Campbelltown is home to unique wildlife, including one of the only disease-free koala colonies in NSW. Campbelltown needs planning for protected wildlife corridors, to keep our local wildlife safe and healthy. Campbelltown has seen an explosion of high-density development in the last few years, placing a strain on local roads and services. There needs to be a clear, funded plan for the provision of new infrastructure before any new high-rise units are constructed. The Campbelltown Animal Care Facility has been, despite the best efforts of dedicated staff, one of the worst-operating pounds in the state. The Greens will push for the full implementation of the Therian Animal Care Solutions recommendations for the facility, with $5 million in capital works and an $895,000 p.a. increase in the facility budget for staff, vaccinations and a volunteer program.